The day the Twin Towers collapsed in Manhattan, September 11, 2001, IDF submarine “Leviathan” of the advanced Dolphin model was on a training sail somewhere at sea – the exact location of Israel’s submarines will always remain classified, even dozens of years after the fact. At one point, the submarine rose to the surface to take a break. The sub’s commander, then-Lt. Colonel Oded, looked through the periscope and saw a calm, blue sea. However, one crew member soon informed him that he just saw the New York towers collapsing on television. Oded’s first reaction was laughter: What kind of movie are you watching there? How could the Twin Towers collapse? Yet soon after, the official announcement arrived from Israel. What does a terror attack at the World Trade Center have to do with an Israeli submarine going on high alert? This question shall remain unanswered as well. We can only guess: When the US experiences an unprecedented terror event whose implications are still unclear, nobody knows how the superpower would respond and what will happen in the Middle East as result. At such moments of uncertainty, Israel’s first walls of defense are its long-range strategic arms – the most secretive one is the submarine fleet. Israel’s enemies must be made to understand that should they dare use any weapon of mass destruction, their own fate will be sealed. According to foreign reports, Israel’s Dolphin fleet plays a crucial role in the game of deterrence with its second strike capability. When I ask Oded whether his troops’ passports would be filled with stamps, had they theoretically stamped them at border control, he smiles and says nothing. Indeed, we can imagine that these virtual passports would have been full of stamps. The Navy’s submarines, as opposed to other vessels, never dock at foreign ports, including friendly ones. This is the nature of the service: The submarines only dock in Israel. In order to serve on a submarine, one needs more than to excel at school and accumulate more and more knowledge. Such soldiers need a specific mental makeup that enables them to be isolated for lengthy periods of time from their natural environment, while living with 40 other people under crowded conditions and an intensive, tense operational atmosphere. So what happens to a young man who one day becomes privy to the State of Israel’s deepest secrets? “If we developed the right person, and his ego is at a healthy place, not much happens,” Oded says. “The heavy responsibility and significance of the work merely increase the need for modesty. Even though it’s quite surprising and fascinating to discover what this country can do, we don’t tell our parents or anyone else. Never. Everything stays within the submarine. This is one of the reasons why the friendships formed between the soldiers and officers don’t exist elsewhere. We develop a culture where secrecy means life or death. In the movies we often see a submarine commander receiving a mysterious message, walking over to the safe, pulling out an envelope and discovering a dramatic mission for the first time. Yet when Oded is asked whether this happens in real life, he bursts into laughter. “This happens in the movies. These are precisely the things that are not done in real life, because the sub commander works completely independently, and at times has no contact whatsoever with his superiors. Hence, he must have all the information available to him and be familiar with the mission’s big picture, so he can make the right decisions. At the end of the 1980s, Oded completed a degree in electrical engineering and physics at the Technion. Upon graduation, he was appointed as commander of a missile boat that specializes in anti-submarine warfare (the Navy ensures that future sub commanders serve on such boats first, as there is no better way to learn how they behave when confronting a submarine.) After two years, Oded embarked on a submarine commander’s course – an intensive eight-month track with a personal mentor. In 1999 he was assigned to command the old-model submarine “Gal.” The only thing he is willing to say about that period is: “It was a very operational year, with plenty of counter-terror activity.” In 2001, he was appointed as the second commander of “Leviathan,” a new model Dolphin sub. When asked how it feels to command “Leviathan,” a submarine that is three-times larger than the previous sub he led, Oded first speaks about the improved shower experience. “When you are sailing for weeks and your only way to take a shower is to use the air-conditioner’s water, yet suddenly you have a shower, only then you understand the meaning of this,” he says. “Suddenly there is a convenient space for service, in submarine terms of course. Suddenly your sub has more than one floor. There are also more arms and more advanced sonar systems. There is also a leap in atomization and in command and control capabilities. It’s like flying into space. Moreover, it’s a very quiet submarine that can perform its mission with greater secrecy. 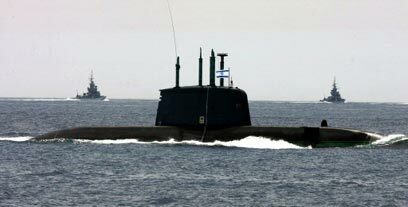 At this time the Navy is preparing to double Israel’s submarine fleet from three to six in the next five years, making it one of the region’s largest and most advanced fleets. As result of this process, Oded was not only required to double the submarine fleet’s manpower, but also to create a larger cadre career officers for a lengthy service term, as the need for professional expertise will only be growing. Hence, the Navy realized it must offer these soldiers the army’s best service terms. For example, sub troops can study almost anything they want, as long as they stay in the force. Notably, a sub officer is required to serve nine years at least. See all talkbacks "Doomsday weapon: Israel’s submarines"